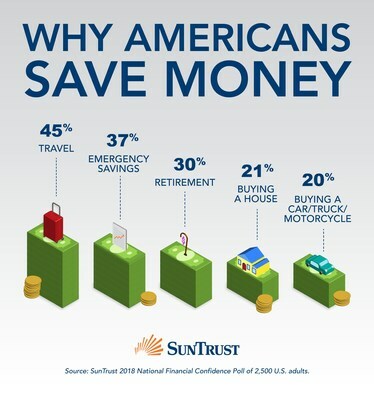 ATLANTA, July 26, 2018 /PRNewswire/ -- SunTrust Banks, Inc. (NYSE: STI) today revealed that more Americans are saving their money for travel, surpassing saving for emergencies, retirement or purchasing a car or home, according to its quarterly National Financial Confidence Poll. At 45 percent, travel is the number one reason for saving, while building a nest egg comes in second place at 37 percent, followed by retirement at 30 percent. Meanwhile, one-quarter of Americans are saving for "little splurges." Even when the survey results are broken down by generation, traveling is still the number one preference for setting money aside. Millennials and the silent generation clock in at 47 percent and 38 percent respectively. Although Americans are prioritizing travel savings, about one-third of those surveyed report regularly feeling stressed about money or finances. "Those who report feeling less stress about money or finances have a higher financial confidence," said Keith Lerner, SunTrust managing director and chief market strategist. "A financial cushion is a smart way to plan for the unexpected, and the peace of mind can increase life satisfaction." According to the survey, the one in five Americans who score highest on financial confidence are more likely to be happier, give to charity and are more satisfied with their freedom to make life choices – like travel. "It's good to reward yourself after you hit a budget goal," said Lerner. "Mastering one's finances is the key to financial confidence. While income plays a part, living on a budget, managing debt, saving regularly – for both personal interests and emergencies – and planning for retirement are all key drivers of financial confidence." SunTrust's Financial Confidence Index is currently 56.9 on a 100 point scale, indicating that Americans' money habits reflect low-to-moderate financial confidence. The quarterly survey polls 2,500 Americans every three months, and it is representative of the U.S. adult population and large enough to address Americans of different ages, incomes and geographic regions. SunTrust Banks, Inc. is a purpose-driven company dedicated to Lighting the Way to Financial Well-Being for the people, businesses, and communities it serves. SunTrust leads onUp, a national movement inspiring Americans to build financial confidence. Headquartered in Atlanta, the Company has two business segments: Consumer and Wholesale. Its flagship subsidiary, SunTrust Bank, operates an extensive branch and ATM network throughout the high-growth Southeast and Mid-Atlantic states, along with 24-hour digital access. Certain business lines serve consumer, commercial, corporate, and institutional clients nationally. As of June 30, 2018, SunTrust had total assets of $208 billion and total deposits of $161 billion. The Company provides deposit, credit, trust, investment, mortgage, asset management, securities brokerage, and capital market services. Learn more at suntrust.com.